I am still processing so many things from my weekend in Utah. 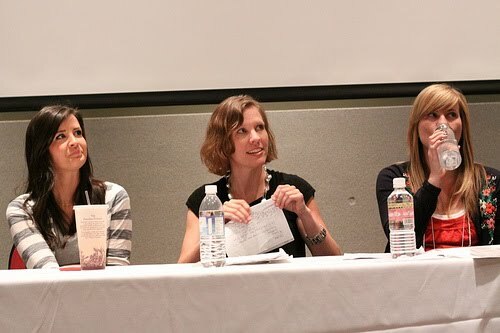 I went to the conference to speak on a panel about blogging and faith (or, as one commenter put it, “blaith”). The panel went well, but I feel like somehow the whole weekend was really a lesson in faith for me. Here I am during our panel. Talking about spirituality makes me thirsty. For Jesus. First of all, this conference was 97.9% Mormon. Which was fine by me, and made my presence at the panel on faith all the more interesting. I have to say – the Mormons could teach us a thing or two about family life. I feel like every mom I talked to had this uncompromising commitment to her family, and talked about her kids with a passion that I don’t hear every day. And, as these things often do, it set me to wondering why that is. I spent a good portion of Sunday prying gently inquiring into Mormon family life, to try to figure out just what is going on that makes them so bonded to their children and (at least outwardly) satisfied with the role of diaper-changer/laundress/line-cook. I do think that they have a better sense of a calling from God to be a mom – that they have been entrusted their children, to nurture and love. And while I could cognitively say that this is true for me, and a part of my own faith, I’m not sure that I live this way or consistently hear this message. I seem to spend a good portion of my day wondering how in the hell anyone is supposed to function with this many small people around – and I will complain about it to anyone within earshot. What I heard from Mormon moms of multiple wee ones was a permeating sense of gratitude for each child that overshadows the day-to-day tedium. There seems to be a great affirmation of motherhood in the Mormon faith, and I wonder if that doesn’t curtail some of this wrestling that so many moms I know have with their identity as a mom. They also make family a priority with their time, and I think I’m ready to institute our own family home evening once a week. And this video . . . about one mom’s gratitude and devotion to God and to her own children . . . I mean, if this doesn’t make you wanna be a better mom, your heart may be frozen. And while I’m not ready to receive a revelation from Joseph Smith (don’t worry, Mom) or vote for Mit Romney (don’t worry, liberal friends), I do feel like I could learn something from this culture of family closeness and community. Another observation that got me thinking this weekend: so many of the bloggers in attendance have dealt with, or are dealing with, depression and anxiety. This was especially true among the speakers. I am certainly in the midst of it, and it really had me pondering why it was so common. I’m curious to know if it’s just a reflection of our society at large, or if writers, by nature, tend to be more neurotic and melancholy. Or do we write because we are melancholy? I haven’t figured it all out. But it was nice to be with women who understand, and who aren’t afraid to be vocal about the heavy toll of a mood disorder. I was also struck by how many of us have experience loss at some level. To be honest, when I first arrived, I had a little (a lot) of anxiety about being in a room full of perky, 20something scrapbooking moms decked out in floral skirts and cardigans. I started getting the familiar insecurities: I’m too cynical, I’m too morose, these women all have perfect lives and I’m a mess. But when you peel back the layers, regardless of whatever shiny exterior is presented, so many of us are dealing with CRAP. And again, is it this heaviness that compels us to write our lives out online? Or is the drama what compels others to read, in a sort of online rubberneck? Or is it just a reflection of the fact that all of us are carrying pain, and some of us just choose to publish it? Because let me tell you . . . there was a lot of pain shared. But these [feminine] powers are the most potent when used to love other women. To support. To carry. Lift. Encourage. Serve. Fight alongside. And in my experience, this is also the hardest part about being a woman. There are forces at work designed to turn woman against woman in an effort to completely destroy the massive amount of good we can do when united. But I also know that I feel the strongest as a woman, when I am helping another woman, or being helped by another woman — whether she is someone I know or a someone who lives across the world. I’d be smart to unceasingly search for opportunities to serve.